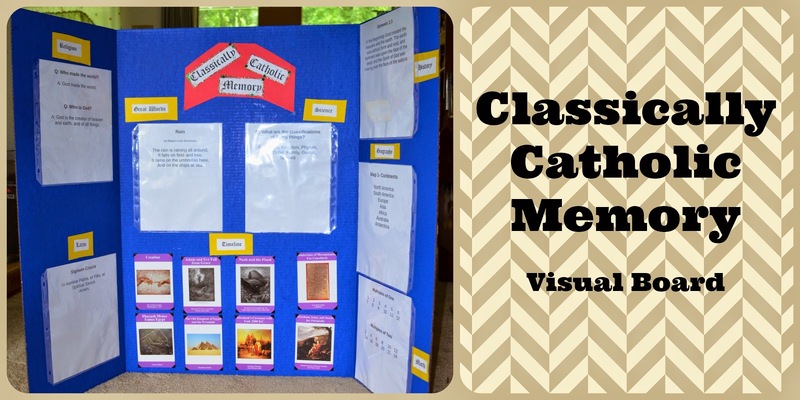 One part of our home school curriculum is a co-op we go to called Classically Catholic Memory. It is similar to Classical Conversations, but it is based on Catholicism instead of Protestantism. I joined the program last year, but with the birth of my third baby, I didn't do much of the memory work with Sebastian. He enjoyed the co-op and has made some good friends there. He even enjoyed the material, but he just didn't have the memory work memorized. We decided that this year, we are going to try harder to get the memory work in both of our heads. The program helps you memorize the information by reading it and listening to it on audio CDs. I decided to help further by making a visual aide to reference each day. This Tuesday, I tackled the making of a visual board! 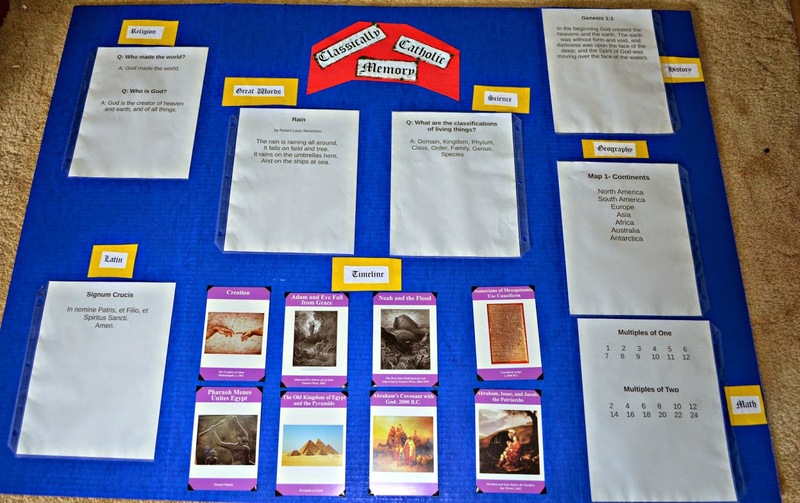 I used page protectors to hold each of the subjects on the board so that we can switch out the pages each session. This means we have only one board instead of having to make a new board for each week. 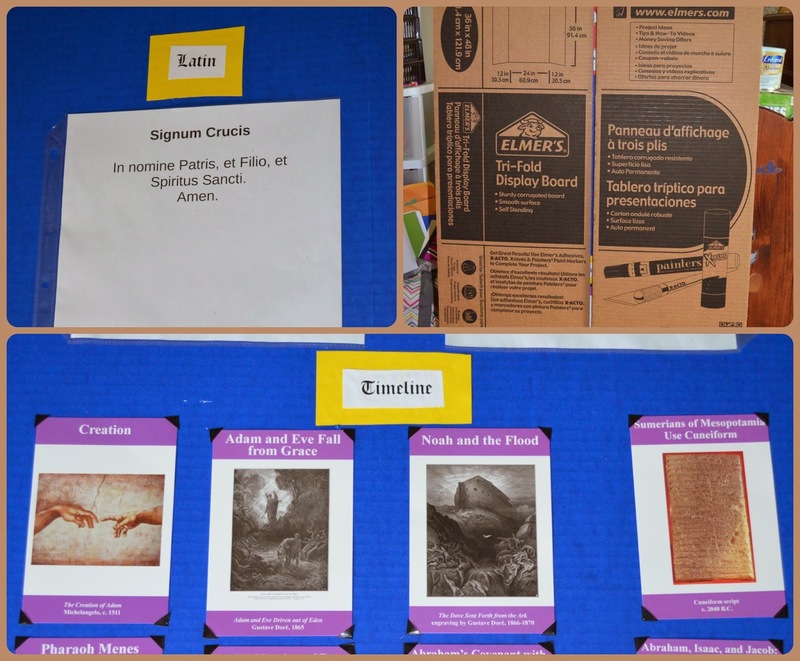 I used picture corners to put the Timeline cards on the board, so I can easily swap them out. Since it is a tri-fold display board, we can easily fold it up and store it when we aren't using it. There isn't a lot of space in our house, so this what the best option for us on limited space. This will be a great way to reference the material as we learn and memorize it.If I wanted to reinforce it even more, I could turn it into copy work and use his written papers to fill the board, but let's be serious. Sebastian hates writing so I will not be doing that to him.